Jeremy S. submitted this photo and caption. This picture is of three members of the Northwestern High School band staff at a fall rehearsal. It was quite chilly so we had a "staff corps jacket" rehearsal. Pictured in this shot in front of our equipment trailer are the three of us drum corps members from three different DCI "eras." 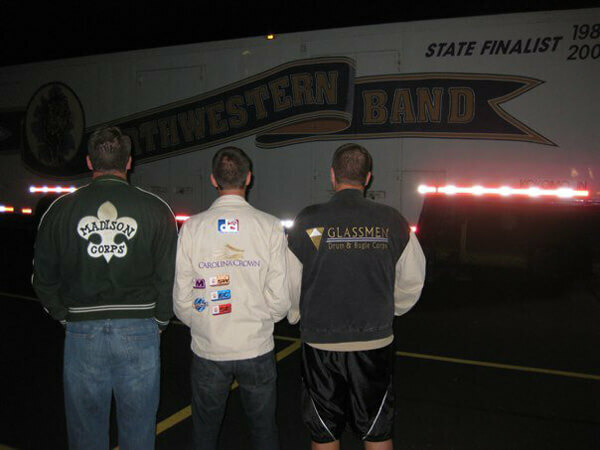 Left to right: Scott (Madison Scouts 1994 – visual staff), Matt (Blue Stars 2009 & Carolina Crown 2010 – visual staff), and Jeremy (Glassmen 1998 & 2000 – Director of Bands).